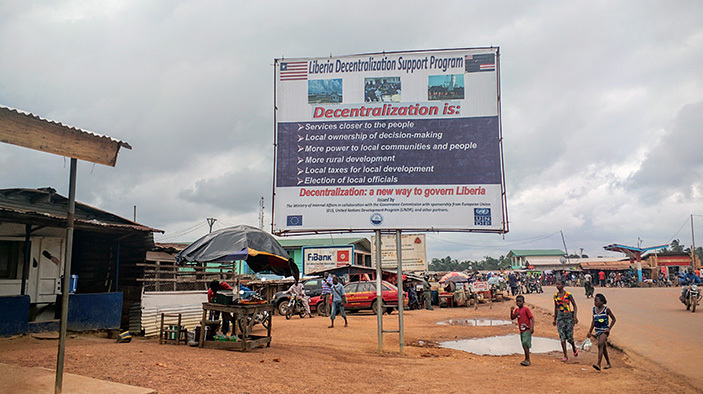 The Government of Liberia has committed to moving forward with decentralization in the near-term, setting the stage for full devolution in the long-term. Greater decentralization will promote the country’s continued development and allow the Liberian people to be “active partners in the delivery of services and in the governance of their communities and counties.” The Local Empowerment for Government Inclusion and Transparency (LEGIT) program, funded by the U.S. Agency for International Development (USAID), is helping solidify this process by facilitating the transfer of authority from the national government to counties and cities, enhancing citizen participation in governance, and building capacity for government officials. LEGIT activities complement the USAID Liberia Accountability and Voice Initiative (LAVI), further enhancing citizen engagement and government accountability throughout the country. Work in at least three counties and three cities across the country to support the capacity building of local government staff. Develop policies and guidelines to improve performance and accountability for local government processes. Facilitate engagement between the Government of Liberia and its citizens. Work with local governments to expand public-private partnerships for basic services. Partner with mayors to examine service fee collection as a potential revenue source. Administer grants, training, and assistance to build government capacity and promote civic engagement.